- Why does the Tesla brand attract the lowest forms of human life? A Tesla owner was found passed out at the wheel after driving 70 miles on autopilot and was arrested on suspicion of driving under the influence of alcohol Friday. The man fell asleep at the wheel and if Tesla's built-in safety feature it eventually pulled over and stopped driving. The driver was identified by California Highway Patrol as Los Altos planning commissioner Alexander Joseph Samek. Samek had the Tesla autopilot function turned on at the time he was pulled over, but the CHP is still investigating before it will come to a final conclusion, according to Officer Art Montiel. The incident occurred around 3:35 a.m. when a CHP officer saw a gray Tesla Model S going southbound on Highway 101. 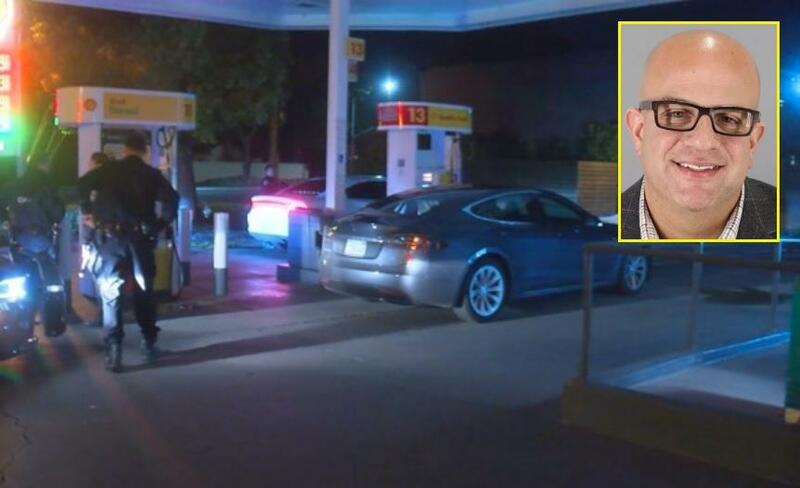 JUST IN: CHP Identify driver of Tesla arrested on DUI suspicion as 45-year-old Alexander Samek from Los Altos. Samek's Tesla was clocked at about 70 mph near Whipple Avenue in Redwood City, according to Montiel. He added that the officer who pulled alongside the car noticed the driver appeared to be sleeping. The officer then tried to pull over the Tesla but there was no response from the vehicle. Using some quick thinking, the officer decided to try another approach, pulling in front of the Tesla. Since Samek would not wake up, the officer pulled in front of the Tesla and slowed down believing that if the vehicle's autopilot function was engaged it would slow the Tesla down when it sensed an object ahead. While the first officer attempted to get the Tesla autopilot to pull over the car, another officer was running a traffic break behind it to keep other vehicles from traveling past the unique situation. The Tesla finally came to a stop in the No. 3 lane north of Embarcadero Road in Palo Alto, a full seven miles from where the officer first spotted the sleeping driver. Officers were able to wake up Samek and put him in a patrol car before taking him to a nearby Shell gas station while another officer drove the Tesla to meet them. Once at a safe location, officers conducted their traffic stop and had the Tesla towed from the Shell. The driver, identified as Los Altos 45-year-old planning commissioner was arrested for DUI, according to Montiel. Samek works as a real estate developer and was only serving his first term on the Los Altos Planning Commission which is responsible for advising the city council on planning and other infrastructure issues. He was recently appointed as chairman of the panel just last month. Montiel said drivers need to be able to control their vehicles. "What we know is that people who are using driver-assist mode need to know they are responsible and aware of their surroundings while the vehicle is in motion," he added. A drunk Bay Area man, passed out at the wheel of a self-driving Tesla on the Bay Bridge, was arrested for a DUI. 3 hours ago ... It took about 7 minutes and 7 miles for the police to be able to pull over a Tesla on Autopilot with a driver allegedly drunk and asleep. 13.10.2017 · Elon Musk, CEO of SpaceX and Tesla, speaks during the International Space Station Research and Development Conference at the Omni Shoreham Hotel July 19, 2017 in Washington, DC. When u pass out behind the wheel on the Bay Bridge with more than 2x legal alcohol BAC limit and are found by a CHP Motor. Driver explained Tesla had been set on autopilot. Tesla's Autopilot systems uses radars and cameras like these to drive themselves in limited situations—but that ability has gotten the cars into trouble. The Tesla Autopilot system was involved in two incidents recently. In both cases, the drivers told authorities they weren't driving, the car was. I stumbled upon an old article in the Galveston Daily News that interviewed Tesla for his views on women. Even though he was alive over 100 years ago, the observations he made on the deteriorating nature of women seem to have gone its full course, meaning that the article certainly would not be published today. A transportation network company (TNC), sometimes known as a mobility service provider (MSP) or ride-hailing service, is an organization that pairs passengers via websites and mobile apps with drivers who provide such services. Did you know that operation of searx.me would cost more than 5000 USD/year?